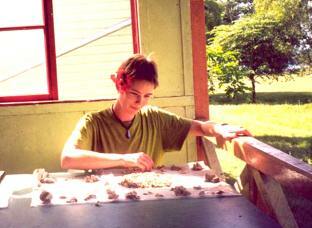 Here's Katherine hard at work in Papua New Guinea (2001) on Anir/Feni Island, New Ireland Province. This photo is taken at the Catholic Mission where they were staying. She doing on-site analysis of the midden. Here, Katherine is busy sorting the shells from one layer of one square into species. Shellfish are a plentiful and easily collected food source that can be found in coastal zones as well as rivers and lakes around the world. Very little, or no specialized equipment is required to procure them, and they can be collected by people of all ages. For these reasons, we would expect to see much in the way of evidence for shellfish consumption in prehistory. While molluscs were clearly consumed in many locales, their importance in terms of prehistoric diet has been the source of much debate in archaeology. Often they are referred to as a 'famine food' and their nutritional value is played down at the expense of terrestrial or non-marine food sources. This attitude has a variety of causes - some grounded in evidence and others grounded in ideological assumptions. Here, we're going to look at some of the evidence for mollusc consumption over time, and look at some of the new data that's changing the way archaeologists look at shellfish. At present, the earliest evidence for shellfish consumption comes from a 300 000 year old site in France called Terra Amata. This is a 'hominid site' as modern Homo sapiens did not appear until around 50 000 years ago. Other early sites include caves and open sites from South Africa dating from 130 000 to 30 000 years ago, the Cantabrian coast of Spain (50 000 to 40 000 years ago), Vietnam (33 000 to 11 000 years ago), Australia (35 000 years ago) and the Bismarck Archipelago in Papua New Guinea (35 000 years ago). These sites represent exploitation of marine as well as freshwater molluscs. New evidence has just shown that Neanderthals gathered and ate shellfish as well. Ordinarily, evidence for the consumption of molluscs and generic marine exploitation comes from material evidence at the site (e.g. deposits of shells and fish bones, the presence of fishhooks, and artefacts manufactured from shell). However, new scientific methods enable us to analyse ancient hominid bones themselves, and assess how much of the diet came from marine sources versus terrestrial sources. Marine protein sources have a slightly different chemical composition to terrestrial protein sources, and through the analysis of stable isotopes of carbon and nitrogen stored in human bone collagen, analysts are able to determine what proportion of protein food was coming from either source. It has been found that, although Neanderthals occasionally utilised marine resouces, their main focus was on large terrestrial game. Homo sapiens on the other hand, had a considerably broader diet, and coastal populations have higher frequencies of marine-derived isotopes in their bones. The broader diet of Homo sapiens may have been one of the reasons why they lived on when Neanderthals did not - in times of scarcity or resource pressure, it is much easier to survive and succeed as a species if one can exploit a wide range of food sources. From about 17 000 years ago until about 7000 years ago the sea steadily rose as the ice of the last glacial maximum melted, inundating many areas of land that were previously dry. It is at this time that we see an increase in the number of sites with shell midden deposits. This has been an archaeological talking point over the last few decades - why did people start intensively exploiting marine resources at this time? The huge shell mounds that can be found on coastlines such as those of the United States, Australia and parts of Europe were first attributed to humans (rather than being seen as natural accumulations) in the 19th Century. The extent of these mounds led to the assumption that prehistoric peoples in these areas were relying heavily on shellfish as a source of food. These shell mounds invariably dated to the Holocene - that is, since the end of the last Ice Age. Early archaeologists sought explanations as to why shellfish gathering and marine exploitation should suddenly become so much more important at this time. They looked mainly towards environmental change for the reason. The famous archaeologist V. Gordon Childe (1925, 1935) suggested that the inrush of the sea at the end of the last glaciation and the increase of heavily forested areas drove people towards the coast. Fitzhugh (1970) argued that the rising sea levels created sheltered harbours and ideal grounds for shellfishing and fishing which had been largely unavailable before. Thus, prehistoric cultures (of Scandinavia in this instance) refocussed their subsistence, or 'food-procuring' strategies. Still others have argued that population pressure forced some groups to draw increasingly on the resources of the coast and sea (e.g. Clark 1952). Whatever the causal mechanism, archaeologists tended to agree that during the Holocene, marine products became important, and that populations around the world had learnt how to exploit a valuable new niche. investment and in terms of protein yield." Based on nutritional data available at the time, shellfish were thought to be a poor source of protein when compared with terrestrial game. This, coupled with ethnographic records telling of the low social status of shellfish and shellfish gatherers brought the archaeology of the 1970s to the conclusion that "shellfish seem to be utilized as food only during periods of famine or low terrestrial productivity" (Osborn 1977). This rather dim view of shellfish as a dietary resource has been called into question on a number of counts over the last couple of decades. Although shellfish had some bad nutritional press for a period, and were believed to be high in cholesterol and low in protein, it is now recognized that shellfish are a very valuable source of protein, amino acids, polyunsaturated fatty acids (terrestrial mammals tend to have a much greater saturated fat component), as well as a wide variety of essential trace elements such as iron, copper and magnesium. Archaeologists studying food procurement strategies have also made a series of good points about the potential advantages of shellfish collection over the hunting of terrestrial game: shellfish are available all year round, they are easily collected with little need for tools or technological expertise and people of all ages can participate. All in all, shellfish gathering is now seen as a low-risk way of gathering food, as opposed to hunting of terrestrial game where success is dependent on technology, weather and seasonality, training and expertise, and potentially also fitness and strength. Feminist archaeologists have also been quick to point out that shellfishing as an activity is more often than not the task of women, and that this fact may account for some of the negative views of shellfishing presented by male informants and observers in some ethnographies. Now that the reputation of shellfish as a food source in prehistory has been 'salvaged', many archaeologists are starting to turn their attention to the study of mollusc remains in sites. Through midden deposits, an archaeologist can get an idea of what was eaten and whether this changed over time. The types of molluscs present in a site can also give archaeologists an indication of what the environment was like at the time the site was occupied - muddier or cleaner, higher or lower salinity, warmer or cooler temperature, mangroves or not, etc. Through the range of shellfish present, we can also start to consider how prehistoric people interacted with the littoral (or freshwater) environment asking questions such as 'which shellfish were selected and which were not?' 'were some species preferred over others?' 'does this change over time?' 'how does a changing environment affect people's attitude to shellfish gathering?'. In addition to giving us information about what people ate and how they procured it, shell deposits have importance in other areas of archaeology. Shells are often used as a raw material for artefact manufacture - shell beads, shell adzes, shell fishhooks etc. Shells are also often valuable items of trade in themselves. For example, small cowrie shells have been found in a site in the Highlands of Papua New Guinea dating back 9 000 years and cowries assumed great ritual and symbolic importance in Chinese culture. Crushed shells were used as a source of lime, pottery temper and in building construction, and shells are one of the most important materials used in radiocarbon dating. With increasing specialization in archaeology, the next few decades should see major advances in our understanding of shellfish gathering and consumption in the prehistoric past. Questions are no longer simply 'what were they eating? ', but now stretch out into environmental, social, gender, and ritual realms to name just a few. Archaeomalacology is becoming a sub-discipline in archaeology, and hopefully with more specialists and broader research questions, shell remains in archaeology will be elevated to its rightful place! Childe, V.G. 1925. Dawn of European Civilization. New York: Alfred A. Knopf. Childe, V.G. 1935. Prehistory of Scotland. London: Kegan Paul. (ed.) For Theory Building in Archaeology. New York: Academic Press, pp 157-205. (ed.) Advances in Archaeological Method and Theory 10. New York: Academic Press.